The Bruce Lacey Experience at Camden Arts Centre is by turns funny, moving, charming and even a little bit irritating. 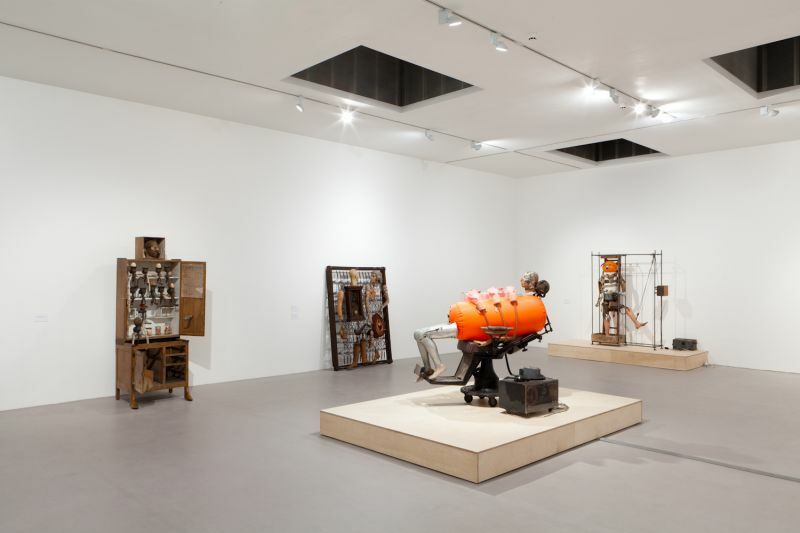 The exhibition, co-curated by art historian Professor David Alan Mellor and artist Jeremy Deller, offers a comprehensive view of Lacey’s inextricably linked life and work. Bruce Lacey, a performance artist before the term was in use, has hung on to his inner child – and exhorts us to do the same – and used it to make work that is, well, more bonkers than most art. But in a good way. 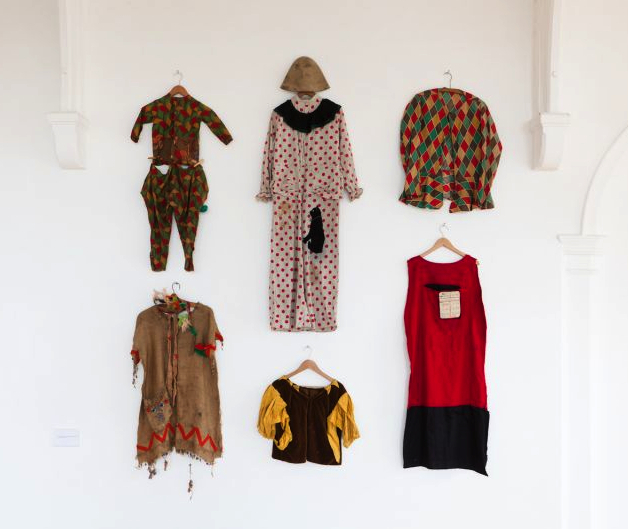 In the first space, there are artefacts from Lacey’s childhood – including the costumes worn by Lacey and his sister for dressing up games and presenting shows to their family, evidence that his showmanship and sense of the absurd (one of the costumes is a postbox, for instance) started early – some presented as installations, along with his paintings from Hornsey School of Art and the Royal College of Art. Here we discover the origins of Lacey’s later work and get a sense of the ideas that have stayed with him throughout his life. Though this is interesting, not least as an insight into a different age – Lacey was born in 1927, so his childhood was in the London of the earliest pictures in Another London: International Photographers Capture City Life 1930–1980 at Tate Britain which I wrote about the other day – it’s the work in the second room that properly holds my attention. 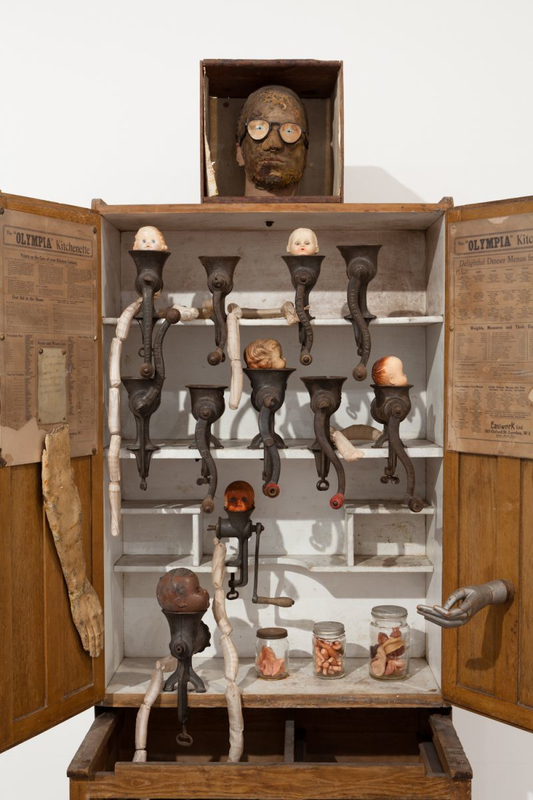 Many of the works here, made in the 1960s and ’70s, are assemblages – sculptures made from putting parts of objects together as a kind of three-dimensional collage – often quite literal once one understands Lacey’s thinking, but with a dose of absurdity. For instance School Days, which shows the head master overseeing the process of turning children into uniform beings, presented here as sausages emerging from mincing machines into which the children – in the form of dolls’ heads – are being fed. 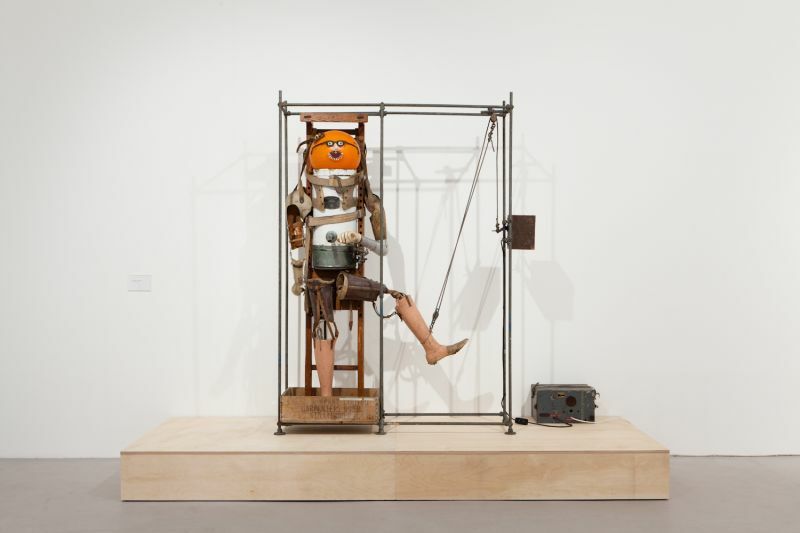 Many of the works are kinetic; the creature going by the name Boy oh boy. Am I living? has had so many parts replaced that nothing original is left. He is excited to discover that he is still living, if only in being able to kick. It’s in this room that we really see the connection between Lacey’s sculpture and his cabaret and television performances. He emerges as an artist who fully allows his sense of humour to drive his art practice and as someone always ready to just get on and make stuff. The bizarre characters that emerge in robot form are funny, even if in a couple of instances the sexual politics clearly come from a different era. As usual with Camden Arts Centre exhibitions, there is a video of the artist talking about the show both in the gallery foyer and online. This is a show that in places really benefits from hearing what Lacey has to say. He comes across as pleasingly eccentric – again, in a good way – and having retained the childish enthusiasms and sense of the absurd that are so clearly present in his work. This entry was posted in Assemblage, Sculpture and tagged art, assemblage, Boy oh boy. Am I alive?, Bruce Lacey, Collage, comedy, School Days, The Bruce Lacey Experience by Ann Jones. Bookmark the permalink.